Hundreds of children from four to 10 years old have taken part in the ‘Child Troop Parade’ in the Russian city Rostov-on-Don. The parade was headed by a serving lieutenant-colonel. Schools and kindergartens have lined up in 'military formation' near the local Officers’ Club by companies and platoons, constituting an entire battalion. The squadron consisted of a kindergarten ‘Navy’, special task forces made up of 4th graders, pilots and even hussars. The kids also rolled out their version of ‘military equipment’ to a tune played by a military band. 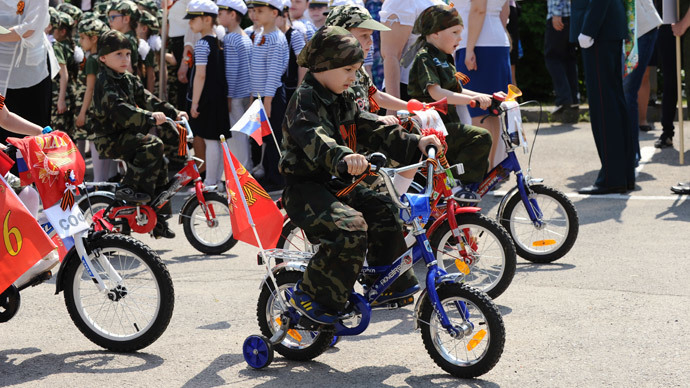 “Today the children are at the wheels of military bicycles and scooters, and tomorrow we hope to see them at the wheels of tanks and artillery pieces,” one of the event’s organizers said, as quoted by Newsru.com website. Others said it encouraged patriotism in children and praised the event. The parade was commentated by an announcer over loudspeakers. He said the kids were “the future generals of Russia,” as quoted by Arguments and Facts newspaper. Some kids were holding portraits of their relatives, mostly great-grandparents who fought in World War II, in a similar fashion to the Immortal Regiment march in Moscow on Victory Day. The event was led by a real lieutenant-colonel serving in Russia's Southern Military District, who saw action in the North Caucasus, Vadim Mirtya, according to 161.ru news portal. The parade was not a new event. Rostov-on-Don has held it six times in the past, but this year there were more children, with even preschoolers falling into step.